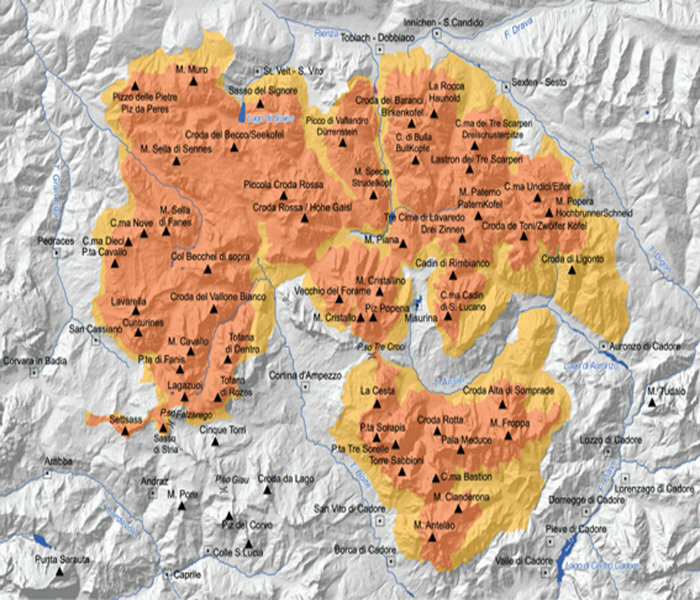 The most extensive of the UNESCO Dolomite systems, it covers an area of 53,586 hectares in the provinces of Belluno and Bolzano. Its boundaries are the Pusteria, Sesto and Badia valleys, Valle di San Cassiano and the Boite and Piave valleys and it consists of four main areas: the Sesto-Cadini Dolomites, the Braies-Senes-Fanes chains with the Tofane and Cristallo peaks and the Cadore Dolomites. The Sesto-Cadini Dolomites are in the far north-eastern part of the Dolomites, featuring spectacular peaks looming more than 2,000 metres above the huge rocky high plateaus. As well as the triple peaks of Tre Cime di Lavaredo, undoubtedly one of the most well-known and iconic chains, the system is also home to mounts Croda Rossa (3,146m), Punta Tre Scarperi (3,152m), Croda dei Toni (3,094m) and Cadini di Misurina (Cadin di San Lucano 2,839m). 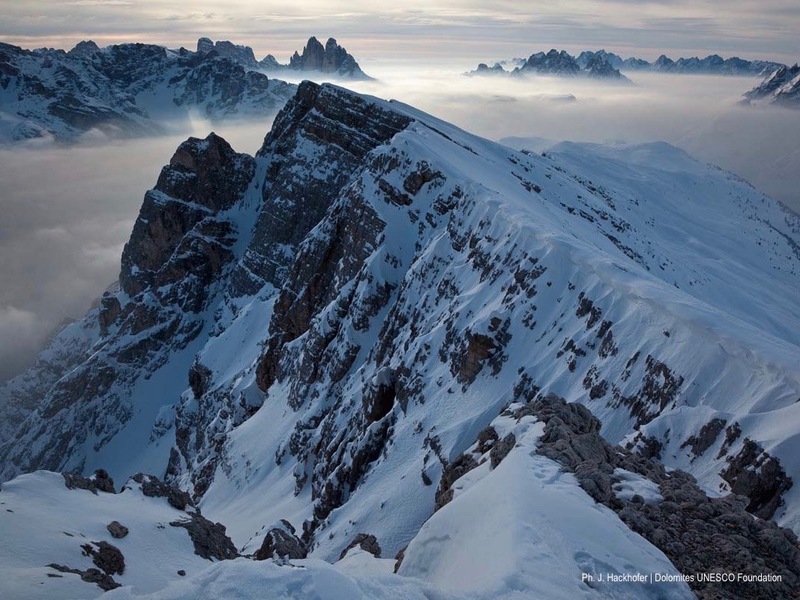 Val d’Ansiei separates the Sesto-Cadini Dolomites from the Monte Cristallo chain, dominated by the peak of the same name that towers up to 3,221 metres. Valle di Landro separates the Sesto-Cadini Dolomites from the Braies-Sennes-Fanes chain and the Tofane peaks, an area occupying the north-western and central part of the Northern Dolomites system. 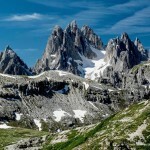 Among the peaks in this area are the Lagazuoi crest (2,762m), the Tofane peaks (Tofana di Rozes 3,225m, Tofana di Mezzo 3,244m and Tofana de Inze 3,238m) and the Conturines chain. 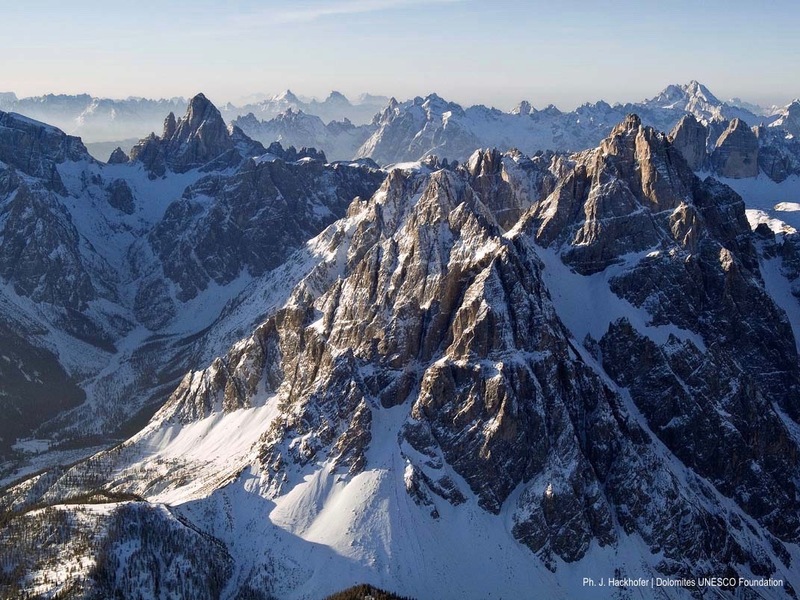 The Cadore Dolomites to the south-east are dominated by mounts Sorapiss (3,205m), Marmarole (2,932m) and Antelao which, at 3,264, is the second highest peak in the Dolomites after Mount Marmolada. The Northern Dolomite system has an extraordinarily rich heritage in terms of its landscape, natural history and geology. Because of this and the sheer size of the area, there are three protected areas so designated to safeguard and enhance its natural beauty. Il Parco Naturale Fanes-Senes-Braies, entirely located in the Province of Bolzano, was designated a natural park in 1980 and today this is a protected area of over 25,000 hectares, including the Pusteria valley to the north, the Badia valley to the west and the Landro valley to the east. The southern boundary of the park is also the border with the Province of Belluno. The imposing peaks of Conturines and Croda Rossa form a crown whose varied landscape of high plateaus and pastureland is dotted with numerous dairies. As well as its rich geological and botanical heritage, it is the ideal habitat for many species of mountain wildlife, such as the Alpine marmot, which is also the parkland symbol (www.provincia.bz.it/natura-territorio/temi/parchi-naturali.asp). Il Parco Naturale Tre Cime was designated a protected area in 1981. 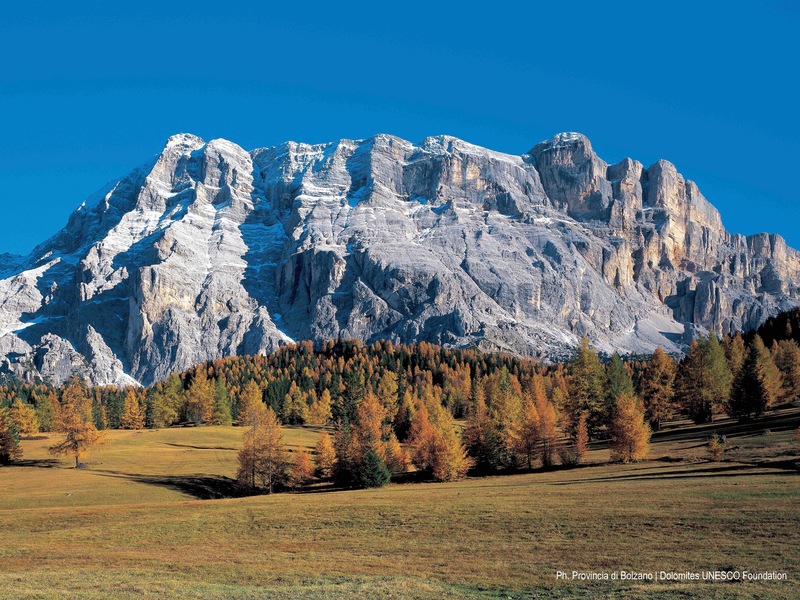 Next door to the Parco Naturale Fanes-Senes-Braies park, its 12,000 hectares, entirely within the Province of Bolzano, are bounded to the north by Val Pusteria, to the south by the Province of Belluno, to the east and west by Val di Sesto and Val di Landro respectively. 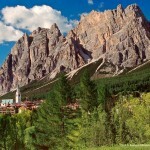 Among the highest mountains in the parkland are Punta Scarperi and Tre Cime di Lavaredo from which the park takes its name. In addition to its geological and botanical importance, the parkland is home to a great many species of bird, in particular the golden eagle and the wallcreeper, the latter the symbol of the protected area (www.provincia.bz.it/natura-territorio/temi/parchi-naturali.asp). 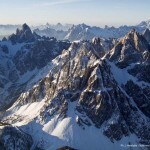 Il Parco Naturale delle Dolomiti d’Ampezzo, designated a protected area in 1990, covers an area of 11,200 hectares entirely within the Municipality of Cortina d’Ampezzo, once the property of the local land management institution Le Regole d’Ampezzo. Bounded to the north by the Fanes-Senes-Braies parkland, the land in the Province of Belluno together with that in Alto Adige forms a single complex with similar environmental features. 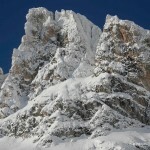 The Ampezzo Dolomites include the Cristallo, Tofane and Lagazuoi chains. 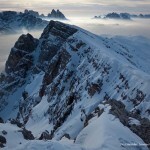 This natural parkland, established to safeguard the unique, priceless geological and natural heritage of this area, has chosen as its symbol the sempervivum dolomiticum, also known as the houseleek, a plant that is endemic exclusively to the Ampezzo Dolomites (www.dolomitiparco.com). This area is the most extensive of the UNESCO Dolomite systems. Here there is the widest range of rocks formed in the most continuous sequence. These mountains tell of the environments that succeeded one another over a period of over 270 million years, from the metamorphic base of the Palaeozoic era, over 300 million years ago, to the Tertiary, Oligocene-Miocene era of 30 million years ago that produced the outcrops on Monte Parei. 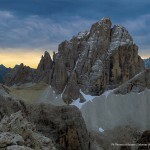 This can be divided into three sections: Dolomiti di Sesto, Tre Cime and Dolomiti Cadorine, Settsass, Fanes, Sennes, Braies and Dolomiti Ampezzane. In the Sesto valley and Val Pusteria the sequence of Permian rocks tells the story of the erosion of the ancient Hercynian mountain range, Sexten conglomerate rock. The eroded material was carried down to a desert plain crossed by short-lived rivers, Val Gardena sandstone. Here are the fossilised remains of the first Dolomite sea that lapped at the coastal strips creating lagoons in a dry climate, the Bellerophon formation. The sea then invaded the entire area and, over a period of several million years it advanced and retreated in cycles, the Werfen formation. In the Sesto and Cadore Dolomites rocks are preserved that recount the various stages in the evolution of the Triassic archipelago. The amazing temporal continuity of these specimens indicates that they suffered little disturbance from the volcanic activity of the mid-Triassic period. This area features a basal slab formed from the joining together of a number of fossil islands from the Anisian to the Carnian eras. This was followed by the extensive high plateaux of the rock that filled in the Carnian sea, leading to the disappearance of the Triassic archipelago, the Helingkreuz and Travenanzes formations. The various generations of islands and reefs are preserved in their original three-dimensional form. 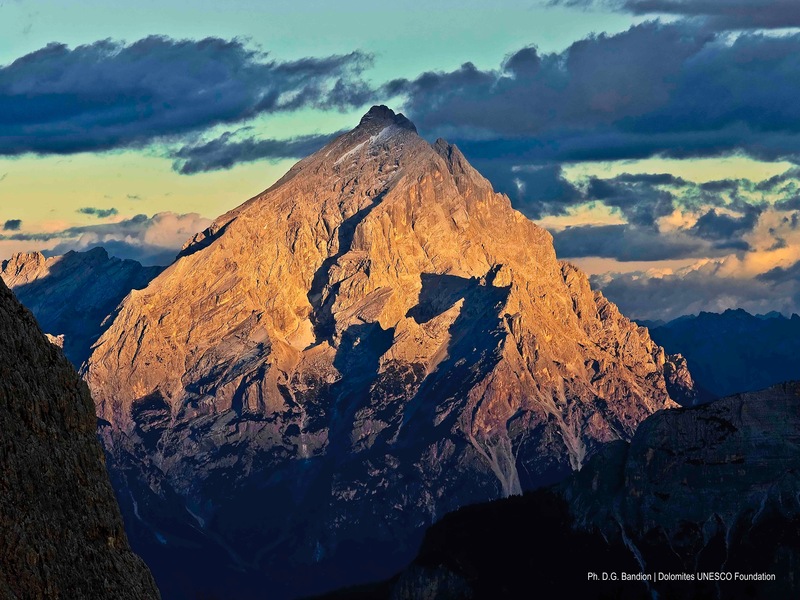 The Ladinian island was extremely resilient and enabled some of the most famous peaks to take shape, among them Croda Rossa di Sesto, Cima Undici, Monte Popera, Cima Bagni, Cima Una, Punta dei Tre Scarperi, Rocca dei Baranci, Croda dei Baranci and Marmarole). The Picco di Vallandro area provides an excellent view of the geometry of the steep slope of the Carnian fossil island and of the relationship between this and the deep-sea deposits. Prato Piazza and Alpe di Specie are areas that have yielded significant fossil remains capable of painting a detailed picture of some of the fauna responsible for the growth of the Carnian islands. 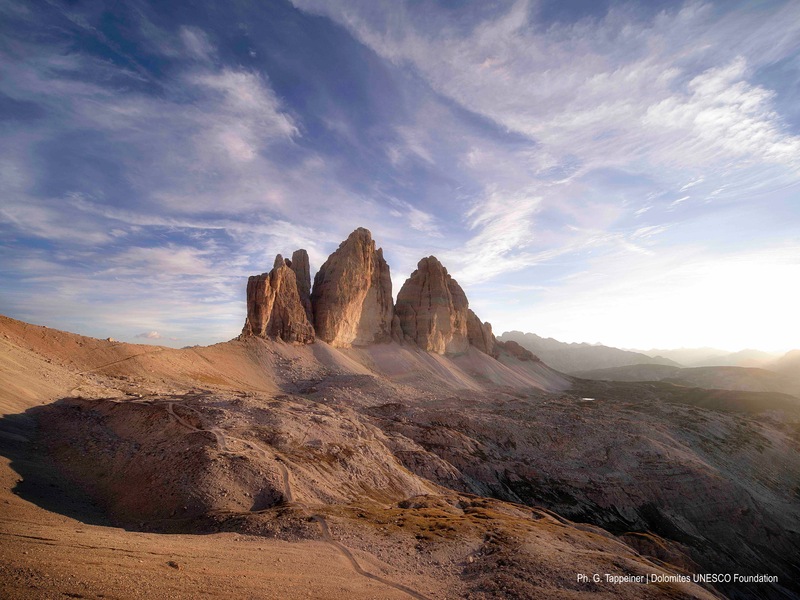 The dizzying vertical rock faces, carved in Main Dolomite rock, of some of the most imposing peaks, such as Tre Cime di Lavaredo, Monte Paterno and Croda dei Toni, are formed from the residue of the great tidal plain established at the end of the Triassic period. The southern part, the Cadore Dolomites, display the geometry of the Carnian islands, clearly relating the stages in the disappearance of the Triassic Dolomite archipelago. Some footprints of theropod dinosaurs and fossil amber have been found in the HelingKreuz and Travenanzes formations of these rocks. Finally, to the south of Val Ansiei (Marmarole, Croda Marcora, Sorapiss and Antelao peaks), it is possible to see rocks that tell of a massive tidal plain of Main Dolomite and of its gradual sinking that began at the end of the Triassic period, evident in Dachstein limestone, and continued in the Jurassic period. The most interesting geomorphological features in the Sesto/Tre Cime area are the great plateaux, Piani di Lavaredo and Piani di Cengia, the ledges and balconies that formed on the roof of the Dolomites, evidence of the Ladinian-Carnian islands, whose softer rocks contributed to the disappearance of the Dolomite archipelago. 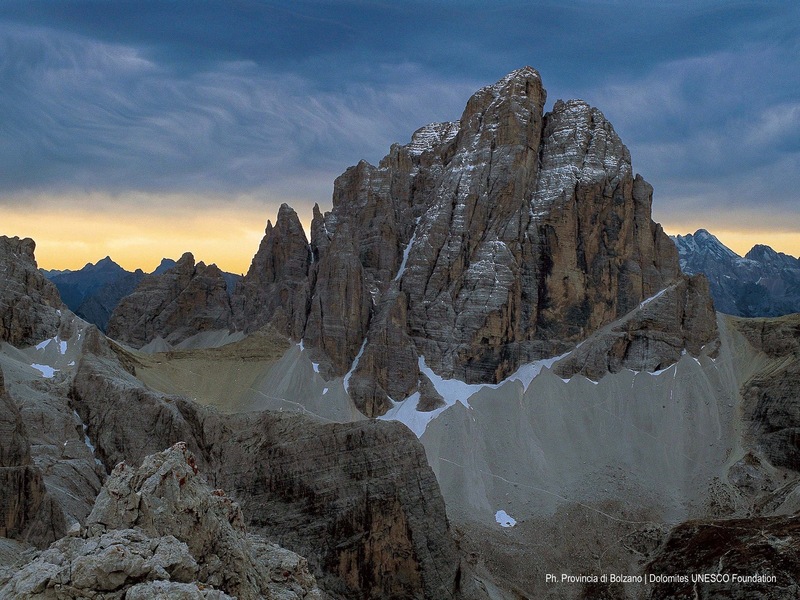 These plateaux form the base for the monumental towers, the Tre Cime di Lavaredo, Torre Toblin, Torre dei Tre Scarperi, the jagged crests of Croda de Toni and Monte Paterno, all carved in even layers out the Main Dolomite rock. The dense network of faults and subvertical fractures that cut cleanly through the strata are responsible for the steps that appear in the plateaux, for all the spires and pinnacles crowding this place and for the geometry of the pinnacles, rock walls and the deep valleys running in straight lines radiating out from the plateaux (Val Fiscalina, Val di Campo di Dentro, Val Popena, Val Giralba, Val Marzon, Val de Ambata, etc.). There are plenty of features caused by erosion and glacial deposits, such as cirques, sheepbacks, hanging valleys, banks of moraine and erratics from the late glacial age. 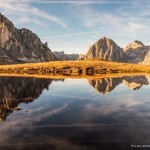 There is an abundance of Alpine lakes whose iridescent waters occupy the glacial depressions formed at the centre of cirques, for example Alta Val Giralba, Piani di Cengia and Laghi di Lavaredo. Two small snowfield glaciers still exist today at the foot of the eastern wall of Cima Undici. The constant freezing and thawing processes that afflict the walls lead to the formation of extensive debris fields and cones at the foot of the rock walls (Tre Cime, Tre Scarperi, Croda de Toni, etc. ), also a source of debris, for example in Val Marzon. Rock falls and collapses are common sources of landslides, such as the one in 2007 in Val Fiscalina, which was large enough to attract considerable media attention. In the Cadore Dolomites the major thrust faults and folds running E-W, generated by movements in the crust, determine the main layout of the landscape. The marked asymmetry of the Marmarole and Antelao peaks, with their sheer southern faces can be attributed to the general northern inclination of the rock strata. Notable pinnacles isolated by faults are La Torre Sabbioni (Croda Marcora) and Il Pupo (Marmarole). The northern slopes of the Antealo, Sorapiss and Marmarole peaks have been subject to karst and glaciokarst processes capable of enlarging the caves within the imposing banks of grey limestone. Many of the slopes are home to morphological features that are clearly the result of glaciation and can be traced back to the late glacial period and the little ice age. These include the hanging valleys and cirques of Sorapiss and Marmarole with their associated frontal moraines, sheepbacks and striations. Lakes such as Lago Vandelli, waterfalls and gorges are unique features of the Dolomite landscape. Two glaciers, an upper and lower one, still exist on Mount Antelao, although these are in rapid retreat. The large quantity of debris produced by the freezing and thawing process creates rapid debris flows that fan out extensively when they fall to the valley floor, as can be seen in Val Boite, Valle Ansiei and Val d’Oten. The Acquabona, Chiappuzza and, above all, the Cancia debris flows are much feared since they frequently hit the road infrastructure and people’s homes resulting in deaths as recently as 2009. The high-energy forces at work in the landscape are responsible for the rock falls, collapses and landslides. Massive rock avalanches occurred in 1730 on the western face of Croda Marcora and on Mount Antelao in 1814, burying the villages of Chiappuzza, Taulen and Marceana, costing a total of 366 lives. This area merits separate treatment given its historic and scientific importance. The organic origin of the carbonate platforms found in many of the Dolomite mountain ranges was first postulated here. The rocky outcrops around Settsass have always been much studied for their regular sections and the wealth of paleontological evidence. The micro and macro fossils found here can be precisely dated, providing great insight into the Carnian period in particular. This area is home to a Global Boundary Stratotype Section and Point (GSSP) among the rocks of Prati di Stuores, marking the beginning of the Carnian era, 228 million years ago. Another interesting feature is the perfectly preserved aborted reef, Piccolo Settsass- Richthofen Reef, at the base of the Settsass cliff face. This area is one of the most evocative Dolomite landscapes in which the sequence of rocks, over 3,000 metres thick, covers a period from 270 million to 25 million years ago. Here the mountains tell the story of the Triassic archipelago, providing insights into the geometry of the islands with their inner lagoons and the relationship between the islands and the deep-sea sediments that surround them. The Braies/Pra della Vacca area is of major scientific importance for the outcrops of Anisian rocks from the deep sea and continental basins due to the erosion of landmasses that had emerged. These are a treasure trove of fossils with the remains of plants, fish, metazoans, ammonites, reptiles, etc. The Lagazuoi, Col dei Bos and Tofane area contains continuous layers of rocks that make it possible to reconstruct the Carnian environments and that document the end of the Dolomite archipelago. Fossil amber containing some of the oldest insects and mites ever studied have been found among these layers, in the Heilingkreuz formation. Among the other finds are dinosaur footprints and the skull of a stegocephalian amphibian. The Fanes and Sennes areas feature extensive plateaux, their contours modelled from calcareous rocks of the late Triassic and Jurassic/Cretaceous periods. In this part of the Dolomites it is possible to trace the terminal phase in their marine history, marked by the transition from a widespread shallow sea to a deep pelagic seabed gradually filling up, subsequently to be raised up by the beginning of the Alpine collision. The youngest of the Dolomite rocks, formed 25 million years ago, are found here, in Monte Parei and Col Bechei, and a study of these shows how, before their complete emergence from the sea, the Dolomites still retained the residue of that sea with scattered areas of raised land, the Alpine foothills, with a rugged coastline that sometimes took the form of steep cliffs towering over the sea. The geomorphology of this area reflects the structural set-up of the rocky mass, more or less folded into a valley basin. The landscape in the central part is dominated by the plateaux of Fanes and Sennes, with outcrops of calcareous limestone and younger marly rocks of the Jurassic-Tertiary period, while the peripheral areas contain mainly isolated massifs, ridges and rugged mountain chains, such as Settsass, Tofane, Croda Rossa d’Ampezzo, Monte Cristallo, Picco di Vallandro, Sasso del Signore and Monti Muro, sculpted from the varied and complex sequence of rocks produced during the mid and late Triassic period. The orientation of all the deep valleys that run across this area is dependent upon a complex network of thrust faults, in the Val Foresta, Valle di Braies Vecchia, Val di Fanes Grande, Val Padeon, etc., and sub-vertical faults, in the Val Boite, Val di Travenanzes, Val di Rudo, Valle di Fanes, Vallon Bianco, Val Salata, etc., some of which are still active. The prism-like geometry of the towering Principal Dolomite ramparts of mounts Cristallo and Tofane reflects the lay-out of the tectonic fractures. Examples of this are planar forms or shallow inclines such as ledges, balconies and small plateaux formed by selective erosion occurring where the lithological variation within the sequence is most marked. 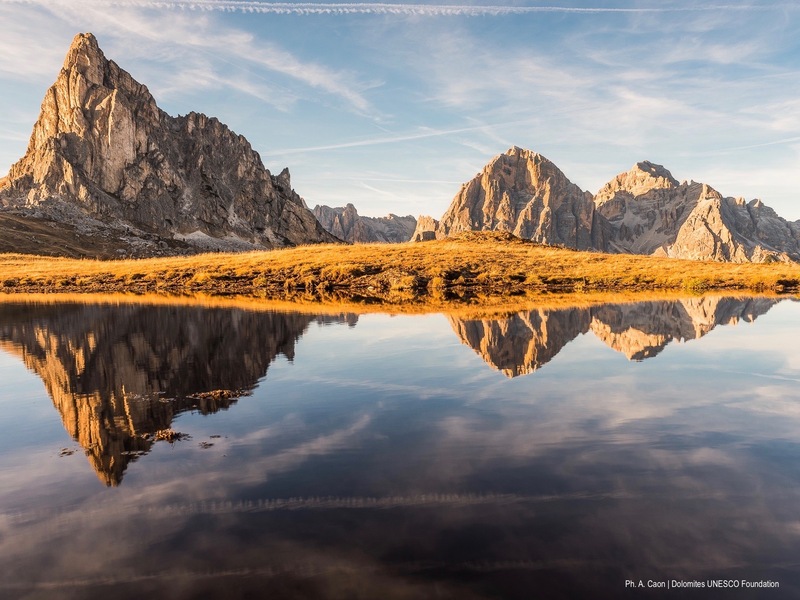 The Fanes and Sennes plateaux are home to the most complete array of karst and glacio-karst phenomena in the whole of the Dolomites, both on the surface and underground. Lakes such as Lago Grande di Fosses, Lago Secco di Fanes Piccola and Lago di Limo sit on depressions of glacio-karst origin. There are widespread glacial morphologies including hanging valleys, cirques, step formations and sheepbacks. Less evident are the late-glacial and Little Ice Age banks of moraine that embellish the contours at higher altitudes. Lobes of moraine led to the formation of some lakes such as Lago Paron and Lago di Misurina. A glacial deposit, Col Bechei, has been discovered in the Fanes area and, in Limo Pass, there are conglomerates that precede the last Ice Age. 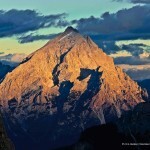 Small glaciers are still active on mounts Cristallo and Croda Rossa d’Ampezzo. Extensive debris fields and cones border the foot of the vertical walls, particular those made of Principal Dolomite rock, of mounts Tofane, Cristallo, Conturines and Croda del Becco. In the area of Braies, in Armentarola and in Ru da Voi, these deposits feed major debris flows. 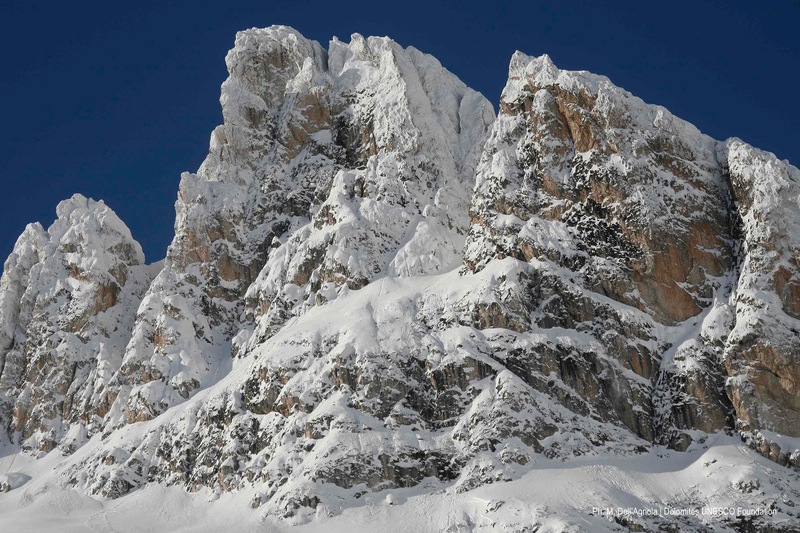 The eastern slopes of Croda Rossa d’Ampezzo contain significant active rock-glacier cirques, the subject of much research. Landslides due to collapse and landslips along a stratum are most common in this part of the Dolomites. At the beginning of the late Glacial and early Holocene periods, major rock avalanches occurred, one of them damming the Valle di Braies thus forming the lake of the same name. 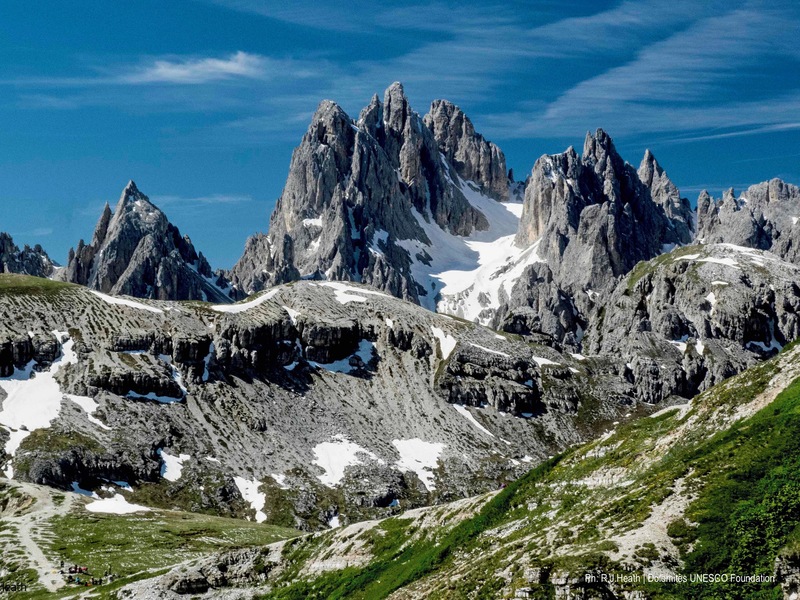 The Northern Dolomites have a varied landscape in which both the natural environment and human beings have played leading roles in encounters, confrontations and conflict, culminating, a century ago, in the bloody events of the First World War. This area was the site of the Italian-Austrian front line, a theatre of war that lives on in the collective memory and in the literature of that period. The diverse cultures that have grown up in this area have, over time, produced countless works of art and human ingenuity, all of undoubted value. The natural environment also has a fascinating history to delve into, as documented by the countless fossil remains and the amazing discovery in a cave in the Conturines of the skeletons of some prehistoric bears, ursus ladinicus, a unique species, unlike any other. The Ladin Ursus Ladinicus Museum in San Cassiano is dedicated to that plantigrade ancestor and to the most ancient history of the Dolomites. The museum is a treasure house of fossils and other remains with plenty of information panels and innovative installations that tell the story of the formation of these mountains. It also has a reconstruction of the cave in which the skeletons of ursus ladinicus were discovered as well as an original skeleton of this majestic beast (www.ursusladinicus.it). Devotees of ancient history will delight in the Rinaldo Zardini Paleontology Museum in Cortina d’Ampezzo that, together with the Mario Rimoldi Modern Art Museum and the Regole d’Ampezzo Ethnographic Museum make up the network of museums of the Regole d’Ampezzo (www.musei.regole.it). There is also the Museo Archeologico Cadorino in Pieve di Cadore and the Museo Palazzo Corte Metto in Auronzo di Cadore. In addition to the Regole d’Ampezzo ethnographic museum in Cortina, to get a real feel for the people and traditions of the area, it is well worth a visit to Il Museo Etnografico delle Tradizioni Popolari in San Vito di Cadore, Il Museo del Cidolo e del Legname, dedicated to the historic timber industry, in Perarolo di Cadore, the house where the painter Tiziano Vecellio (Titian) was born and the optical museum Il Museo dell’Occhiale in Pieve di Cadore. The natural parklands in this system also have exhibitions and plenty of information for visitors wishing to learn more. 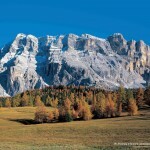 The visitor centre of the Parco Naturale Fanes-Senes-Braies park is in San Vigilio di Marebbe. The cultural centre of the Grand Hotel in Dobbiaco houses the Tre Cime visitor centre that tells the story of the natural landscape and the geological, historical and cultural evolution of that territory, with a particular focus on the Great War in the Dolomites, the beginnings of mountaineering and the development of tourism in Alta Pusteria, in the Tre Cime natural park (www.provincia.bz.it/natura-territorio/temi/parchi-naturali.asp). The walkways, trenches and tunnels built during the Great War are true open-air museums, with their rock shelters forming refuges from hostile fire and a way of skirting around enemy outposts. Much of the relics of this conflict have been recovered and restored and the sites made relatively easy for hikers to negotiate. Of particular interest are the open-air museums in Cinque Torri, Sasso di Stria and Forte Tre Sassi, set between the passes of Falzarego and Valparola, Piani di Lavaredo plains and Monte Piana overlooking Misurina lake, Croda Rossa and Sesto Pusteria. Then there are the Lagazuoi tunnels that run steeply from the peak to Cengia Martini, over three kilometres hewn out of solid rock, today a well-equipped trail with an atmosphere all of its own. The Northern Dolomites are an enchanting system, famous the world over for the beauty of the landscape and the unique features of the natural environment. The mountains of the UNESCO Northern Dolomite system are crossed by four of the eight Alte Vie trails. Alta Via n. 1 runs down from Braiès to Belluno, Alta Via n. 3 from Villabassa-Niederhof to Longarone, Alta Via n. 4 from San Candido in Pusteria to Pieve di Cadore and Alta Via n. 5 from Sesto in Pusteria to Pieve di Cadore. This ring-shaped trail is a classic for hikers in the Dolomites, and it gets quite busy during the summer months. Although the silence of the mountains may be pierced by the sounds of groups of visitors and family outings, this does nothing to detract from the magic of the landscape. This trail, that takes about 3 hours, can simply not be missed. You start from the Auronzo refuge which can be reached from Misurina on foot or by car, the latter with a road toll in the summer months. 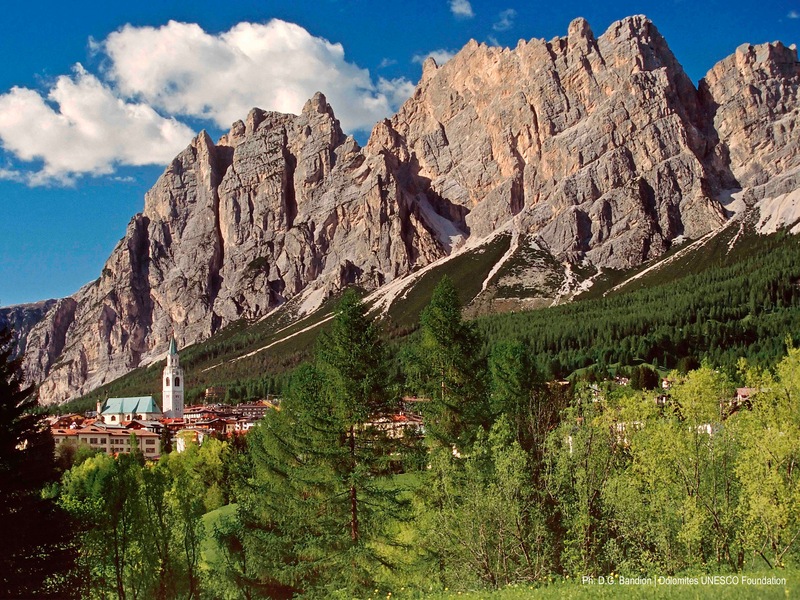 In about twenty minutes a dirt track takes you past the mountain chapel dedicated to Maria Ausiliatrice (Mary the Helper of Christians) then to the Lavaredo refuge. Here you can choose whether to take the steeper path leading directly to the Lavaredo pass or continue along the distinctly less challenging dirt track. The view will take your breath away, embracing the towering three peaks, Le Tre Cime, Mount Croda dei Toni, Valle d’Ansiei, Lake Misurina and the Cadini di Misurina peaks. From the pass you head downhill for a short way on a dirt trail before taking the right-hand path leading to the Locatelli refuge. 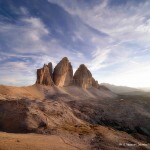 This is the panorama so much loved by photographers, with the Tre Cime, in all their majesty, towering over everything. Before embarking on the last short climb leading to the refuge, you pass by a cavern hewn out of the rock during the Great War. As elsewhere in this system, much evidence remains here of this terrible world conflict. From the Locatelli refuge you descend into the valley at the foot of the Tre Cime, after walking around it, you find yourself back at the departure point. Although the descent is steep, it is quite manageable, on less crowded days you may be lucky enough to encounter a marmot or other specimen of the local wildlife. From the valley floor you head up again toward Col Forcellina and the Longa shepherd’s hut. After this, the trail continues uphill to the high pasturelands where you will see the little lakes of Tre Cime, and the scree leading to the Forcella di Mezzo pass. Where the trail forks, you turn left to return to the refuge. You can reach Capanna Alpina by car, three kilometres to the north of San Cassiano, along the Valparola pass. Footpath 11 takes you to Plan de Furcia through a magnificent Norway spruce wood. You carry on uphill toward Col de Locia, as the trail unwinds across a broad valley between the Fanes, Campestrin and Conturines chains, until you reach Ju dall’Ega. The view is simply stunning, along an undemanding, almost flat trail across the Fanes pasturelands to Alpe di Gran Fiames and the lake Lago di Limo, the highest point on the trail. A rapid descent takes you to the Fanes refuge. From here you take footpath7 to reach the lake Lago Piciodel and the Pederü refuge. The legend of the Kingdom of Fanes is one of the most fascinating and complicated folktales to have emerged from the Dolomites, perhaps the only Italian legends that stand comparison with the Arthurian legends and the Ring of the Nibelungen. The Fanes legends were collected and transcribed toward the end of the 19th Century by Austrian Karl Felix Wolff. In the Fanes-Senes-Braies natural park there is a trail with eleven stretches, tracing the Ladin sagas, which leaves from the visitor centre or from Al Bagn at San Vigilio di Marebbe. The story of the Fanes is extremely complicated and while we provide a brief summary below, it is well worth getting hold of an original version to enjoy it in all its fascinating detail and get a real feeling for the magical spell weaved by these mountains. The people of Fanes were allied with the marmot people. On the queen’s marriage to a foreign king, she decided to keep this alliance a secret from her husband, knowing how ambitious he was. The new king of Fanes forged an alliance with the eagle. In time, the royal couple produced twin girls, Dolasilla and Lujanta. The queen, keeping this hidden from her husband, pledged the second-born girl to the marmot people, as a guarantee of their secret alliance. The animals returned the favour, presenting the queen with one of their cubs. The king wished to pledge his daughters to the eagle and he handed them over to a servant to make the exchange at the summit of Mount Nuvolau. The servant, in connivance with the queen, gives the eagle a bundle containing only the marmot cub. On the road home, the servant was surprised by the sorcerer Spina de Mul, who tried to kidnap the princess. The young prince Ey de Net intervened and saved the little girl. When Dolasilla reached the age of majority, the ambitious king decided to hunt for the treasure of Lake Argento and took his daughter along on the trip. During the expedition some dwarves gave the princess a magic powder that would make the treasure rise to the surface if she threw it into the lake. They also gave her an ermine stole which became an impenetrable suit of armour. Together with the treasure, Dolasilla found some magic arrows that could never miss the target. Clearly she was destined to become a great warrior. As in all spells, there was a condition to be met – the princess must not go into battle if the fur changed colour. From that day on, Dolasilla became a formidable warrior, she led the army of the Fanes people, winning many victories and enabling the king to expand his realm into the surrounding territories. However, the sorcerer Spina de Mul was plotting against the king of Fanes, attempting to make the neighbouring people rise up against the ambitious king and his army, asking Ey de Net to distract Dolasilla to keep her away from the battle. In a careless moment, the sorcerer broke his agreement with the prince and injured the princess. To protect her, Ey de Net asked the dwarves of Latemar to forge a shield so heavy that only he could lift it. The king of Fanes asked the dwarves for the same thing, demanding a shield that would even protect Dolasilla from magic weapons. The dwarves got confused and only forged one shield, a shield that was so heavy that, when it was delivered to Fanes castle, no one was able to lift it. Then the King called upon all his soldiers and subjects, trying to find one capable of lifting the shield and defending the princess. Then Ey de Net stepped forward and won the challenge. Now the Fanes army took up where it had left off, conquering all before it with Dolasilla and Ey at its head. Needless to say, the two fell in love, but the king was afraid that his invincible daughter would give up her warrior ways, so he banished Ey de Net from his kingdom. In protest, Dolasilla refused to fight anymore. In the grip of his mania for riches and power, the king of the Fanes sold his kingdom and its people to the enemy and went off to hide on Mount Lagazuoi, waiting for the Fanes to be vanquished so he could claim his reward. To save her people, Dolasilla decided to fight one last time, but she was tricked into letting her enemy Spina de Mul have some of her invincible arrows. On the day of battle, the fur of the ermine suit of armour changed colour. Although Dolasilla remembered the dwarves’ warning, she felt she had to go into battle. She was hit in the heart by one of her own arrows and died, her lover Ey de Net arriving too late to save her. This marked the end of the Kingdom of Fanes. The victorious Spina de Mul rushed to Mount Lagazuoi where he turned the traitorous king to stone. We can still see that rocky spur that was once an over-ambitious man and it would seem that the Falzarego pass, at the foot of the mountain peak, is named after him since in Ladin, the local language, the expression fàlza rego, means “false king”. With the army of Fanes beating a retreat, the queen sought the help of her allies, the marmots, if not to save her daughter, at least her people. Princess Lujanta, the other twin sister who had been handed over as a baby to the marmots, returned to the village to lead the survivors to safety in the kingdom of the marmots. The population had been saved but Fanes was destroyed. Its inhabitants live on in a subterranean kingdom, still waiting for the advent of that promised era of peace and prosperity. It is said that still today, just once a year, Lujanta and her mother appear in a boat on Lake Braies and legend has it that, at the bottom of that lake there lies a door leading to the last refuge of the Fanes.